It wasn't really a mommy and me class, but my mom was an excellent date tonight for a chocolate-making workshop at the Rocky Mountain Chocolate Factory in Park Ridge. When I asked her what she wanted for Christmas, she told me there wasn't a single thing she wanted or needed. she was far more interested in experiences than things. So when I saw this on Living Social, I knew it would be perfect. Alas, my parents are free-roaming ramblers in their RV, so it's been tough to find a time to go to this session. I'm so excited we got a chance to do this tonight! It was a small group of five set up at work stations at a table behind the counter. 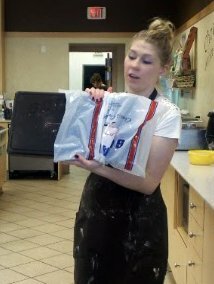 The owner explained how they receive the chocolate in 10-pound bars that they break into chunks and temper at the appropriate temperatures before using it to coat all sorts of stuff, including marshmallows, graham crackers, massive granny smith apples, pretzels, bananas and anything you could ever want. The table was set up with two bowls of confectioner's blend for the table to share, which was creamy and sweet, but not white chocolate. In fact, this blend was safe for dogs and the shop sells dog treats dipped in it. 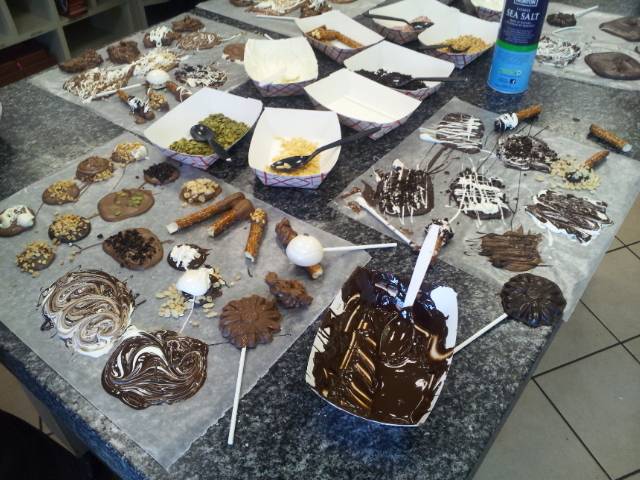 In addition to the "white chocolate" to share, we had out choice of milk or dark chocolate for our individual creations. I went with dark and my mom went with milk. We are the perfect pair. The table also contained an array of toppings, including sprinkles, crushed espresso beans, pretzels, marshmallows, rice krispies, chopped peanuts and sea salt (my favorite). 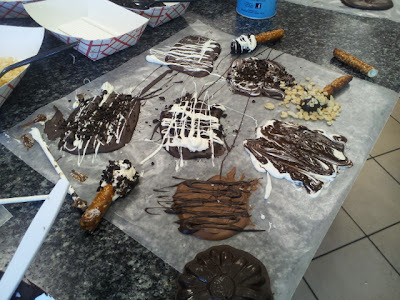 The owner showed us how to make chocolate bark and molded chocolate pops, as well as chocolate dipped pretzel (which I'm a professional at after Katie's Harry Potter Party). So we started dipping, swirling and sprinkling. I made several bark pairings, mixing different chocolates and toppings. I made a tasty, sweet mess. 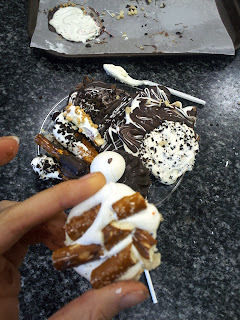 Our other classmates were quick to scatter, but I took the no chocolate left behind approach. 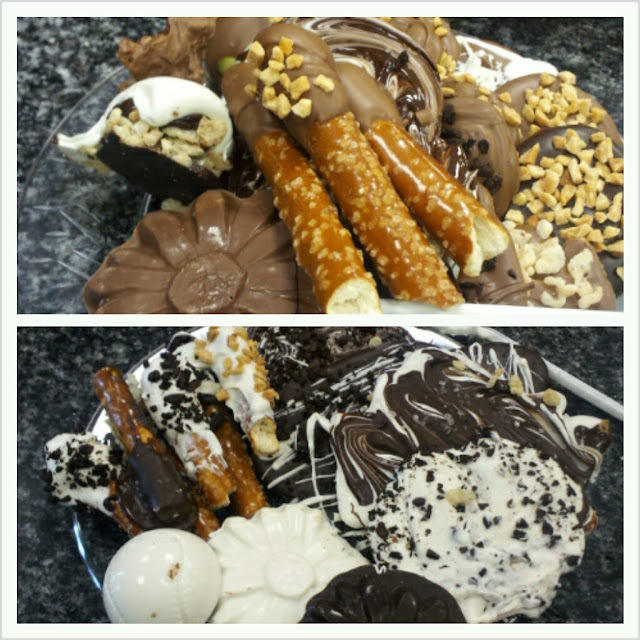 Fairies die every time to waste chocolate, after all, and the chocolate we didn't use would go in the trash. So my mom and I were the last to leave (it's kind of like shutting down the bar, just earlier). my favorite combo had to be rice krispies mixed with dark chocolate and topped with a drizzle of white chocolate. So. Good. Thanks for a wonderful evening, Mom! We really need to have more gatherings over chocolate, with chocolate and containing chocolate. I DID NOT KNOW THEY DID THAT THERE. This place is literally across the street from my office. OK, down a block and across the street. Now THAT'S the kind of cooking class I'm talking about! 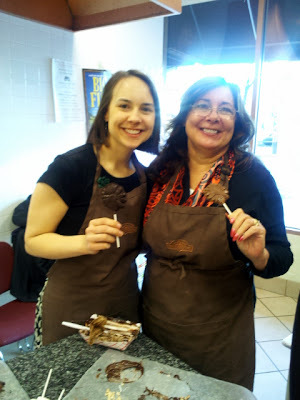 What a fun thing to do with your mom. Yum! I would be all about the sea salt. That is my favorite combo! One time we did this at my grandma's house when we were all camped out there for a funeral. You can cover so many things in chocolate!